In a month that saw Canelo Alvarez defeat Gennady Golovkin and Anthony Joshua knock out Alexander Povetkin at Wembley Stadium, it was Sho Kimura and Kosei Tanaka who may have stolen the show with what may end up as the best boxing fight of the year. In an all-action fight that never saw a dull moment, Tanaka captured the WBO Flyweight title with a majority decision win over Kimura. Tanaka won on two of the judges’ scorecards with scores of 116-112 and 115-113 while the third judge had the fight even at 114-114. Both Kimura and Tanaka wasted zero time getting to the action as the first round had both men throwing dozens of power punches. Tanaka initially overwhelmed Kimura with combinations starting with the left jab and ending it with a big right jab. Tanaka, on the other hand, established an offense that saw him primarily try to take down Kimura with hundreds of body punches and uppercuts. It was Tanaka who initially had the upper hand, hurting Kimura in the second round with a right jab, but the champion quickly bounced back and continued working the body. Over the course of the next few rounds, Kimura would start breaking down Tanaka with the aforementioned body shots. Despite getting slowed down just a bit by Kimura’s body shots, Tanaka continued to press forward, still throwing vicious combinations. While Kimura tried to fight Tanaka at close range, the challenger wanted to keep his distance a bit and throw the lead right to Kimura. The fight never slowed down with neither fighter taking a round to rest up or simply play defense. At most, the fight had only a couple of clinches and the referee stopping the action at times with Kimura leaning forward and almost headbutting Tanaka, though no foul was ever committed. The last couple of rounds saw both fighters still throwing every punch imaginable at each other with both faces swelling up from the constant punishment. In the last round, there was a moment where both men threw a single right jab to each other four straight times simulated which sent the crowd at the Takeda Teva Ocean Arena in Nagoya, Japan in a frenzy. By the end, both men were exhausted and unsure of who won the fight. Kimura now continues his dominance over the lower weight classes after having won world titles at 105 and 108 pounds. Kimura won the WBO minimumweight title in 2015 in his fifth pro fight and then would hold the WBO light flyweight title from 2016 to 2017, making three total title defense across the two previous world title reigns. The loss ends Kimura’s reign as the WBO champion at nearly 14 months. Kimura won the title last year in China when he scored a minor upset victory over Zou Shiming when Tanaka managed to stop Shiming in the 11th round despite being down on two of the three judges’ scorecards. 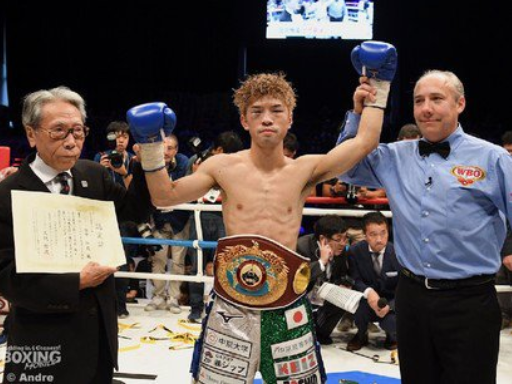 After successfully defending the title on the annual Japanese New Year’s boxing supercard, Kimura returned to China last July to knock out Froilan Saludar to retain the title a second time, setting up the showdown with Tanaka. The 23-year old Tanaka also made history with the victory over Kimura. Tanaka became the third-youngest fighter in history to win a world title in three weight classes behind Tony Canzoneri and Wilfredo Benitez. Tanaka also tied the record set by Vasiliy Lomachenko for winning a title in three divisions in the fewest amounts of pro fights fought at 12.